Receive 5 beauty products every month! Makeup bags personalized just for you. ipsy was founded by Michelle Phan. Get great beauty offers. Click here to get started. It’s just $10 a month or $110 for the year and one extra glam bag free. 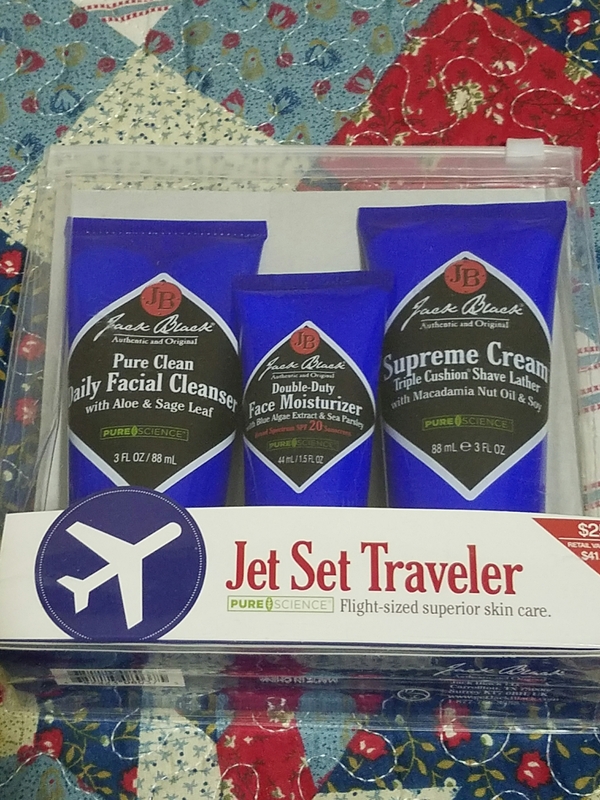 Description: The gift set contains a set of three flight-sized Jack Black essentials: 3 oz Pure Clean Daily Facial Cleanser, 1.5 oz Double-Duty Face Moisturizer, 3 oz Supreme Cream Triple Cushion Shave Lather. Pure Clean Daily Facial Cleanser works gently without over-drying to leave your complexion clean, hydrated, and fresh. Witch hazel acts as an astringent, toner, anti-irritant, and antioxidant. Certified organic chamomile and aloe leaf help soothe and reduce redness. This product will work into a rich lather to remove dirt and debris gently and effectively without irritation or dryness. The result is clean, clear, smooth skin. Double-Duty Face Moisturizer provides lasting hydration to skin without oiliness or heaviness and visibly improves skin’s overall appearance while preventing signs of aging. 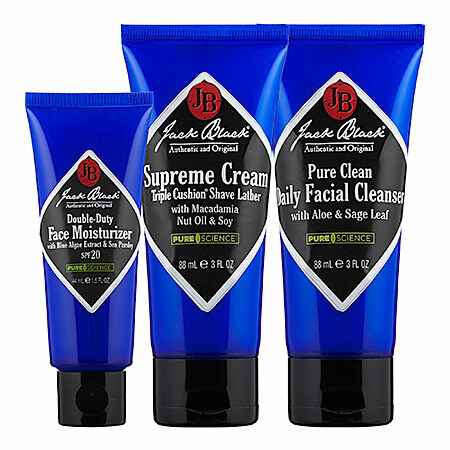 Finally, Supreme Cream Triple Cushion Shave Lather allows for a smooth, close shave without irritation, nicks and cuts, or razor burn. The formula softens irritated and sensitive skin, leaving it bright and healthy and is ideal for sensitive skin. It can be used with or without a shave brush. Ingredients: The ingredients for the cleanser include – Oat- and Coconut-Derived, Sulfate-Free Surfactants that gently but effectively cleanse the skin. It also contains Witch Hazel that acts as a natural astringent with soothing properties. Additionally contains Certified Organic Sage Leaf and Rosemary, which provide antibacterial benefits. The cleanser also contains Certified Organic Chamomile and Aloe Leaf, which help soothe and reduce redness. Other ingredients include: Water, Disodium Cocoamphodiacetate, Sodium C14-16 Olefin Sulfonate, Sodium Lauroyl Oat Amino Acids, Glycol Distearate, Cocamidopropyl Betaine, Glycerin, Aloe Barbadensis Leaf Juice*, Lavandula Angustifolia (Lavender) Flower Extract*, Salvia Officinalis (Sage) Leaf Extract*, Rosmarinus Officinalis (Rosemary) Leaf Oil, Salvia Officinalis (Sage) Oil, Backhousia Citriodora Leaf Oil, Hamamelis Virginiana (Witch Hazel) Leaf Extract, Chamomilla Recutita (Matricaria) Flower Oil, Benzyl Alcohol, Cetyl Alcohol, PEG-150 Distearate, Sodium Chloride, Sodium PCA, Citric Acid, PEG-8 Dimethicone, Dehydroacetic Acid. The ingredients for the moisturizers are: Octinoxate 7.50%, Avobenzone 2.20%, Flower Oil, Butylene Glycol, Calendula Officinalis Extract*, Carbomer, Cetearyl Glucoside, Citric Acid, Cyclopentasiloxane, Dimethcone, Disodium EDTA, Glycereth-26, Glycerin, Haslea Ostrearia Extract, Hydroxyethyl Acrylate/Sodium Acryloyldimethyl Taurate Copolymer, Hydroxypropyl Starch Phosphate, lodopropynyl Butylcarbamate, Lavandula Angustifolia (Lavender) Oil, Lecithin, Leontopodium Alpinum Extract*, Linalool, Melissa Officinalis Leaf Extract, Octyldodecyl Neopentanoate, Palmaria Palmata Extract, Pelargonium Graveolens Flower Oil, Phenethyl Benzoate, Phenoxyethanol, Plantago Lanceolata Potassium Sorbate, Pyrus Malus (Apple) Fruit Extract, Retinyl Palmitate, Rosmarinus Officinalis (Rosemary) Leaf Oil, Sodium Benzoate, Sodium Hyaluronate, Sodium Hydroxide, Tocopheryl Acetate, Water. Finally, the ingredients for the shave lather include: Water, Sodium Lauroyl Sarcosinate, Stearic Acid, Myristic Acid, Palmitic Acid, Glycerin, Lauric Acid, Macadamia Ternifolia (Macadamia) Nut Oil, Simmondsia Chinensis (Jojoba) Oil, Glycine Soja (Soybean) Oil, Peucedanum Ostruthium Leaf Extract*, Buddleja Davidii Leaf Extract*, Artemisia Umbelliformis Extract*, Leontopodium Alpinum (Edelweiss) Extract*, Calendula Officinalis (Calendula) Flower Extract, Rosmarinus Officinalis (Rosemary) Leaf Oil, Pelargonium Graveolens Flower Oil, Anthemis Nobilis Flower Oil, Cocos Nucifera (Coconut) Oil, Cetyl PEG/PPG-10/1 Dimethicone, Perfluorononyl Dimethicone, Potassium Hydroxide, Phenoxyethanol, Disodium EDTA, Butylene Glycol, Iodopropynyl Butylcarbamate, Xanthan Gum, Citric Acid, Sodium Sorbate, Potassium Sorbate. How to Use: In order to use the cleanser simply apply a small amount to moist skin and work into a lather, rinse. It can be used morning and night to cleanse skin. In order to use the Double-Duty Face Moisturizer– apply a nickel-size amount on clean face and neck, use daily, after shaving, and to hydrate and moisturize dry skin. Supreme Cream Triple Cushion Shave Lather can be used by starting with a slightly moist face, applying an even layer of Supreme Cream over face and neck with fingertips or a shaving brush; activating Supreme Cream by working it to a rich, creamy lather using circular motions; shave with a sharp, clean blade, rinsing razor frequently; finally, rinsing face with warm water. Verdict: This is a great gift for the holiday. My dad has a very sensitive skin and often gets razor burns and he absolutely love this brand. It smells really good and very convenient for travel. Most of all it’s cruelty free, and is gentle on skin. What I love the most is that it’s made of certified organic ingredients. My final verdict, I will give this collection 5 stars. Let me know what you think of this brand. Hope you enjoy this blog as much as I love writing it. Don’t forget to check out my Facebook Page and follow me on Instagram @allaboutme3181. This entry was posted in Beauty, Beauty products, Holiday, Shopping and tagged Holiday Gift Ideas, Holiday Gift Ideas for Men, Jack Black, Sephora by allaboutme31. Bookmark the permalink.